ARCHIS announced a RSVP event in Macomb County on the topic of Suburbia After the Crash. In the week that President-elect Barack Obama promised to create the largest public works construction program since the inception of the interstate highway system a half century ago, and President George W. Bush announced to extend up to $17.4 billion in emergency loans to prevent the collapse of General Motors and Chrysler, ARCHIS in cooperation with Abitare magazine and the Netherlands Architecture Institute propose to organize an RSVP event in Macomb County from 20 – 22 February 2009. The ARCHIS RSVP, which is initiated by County Commissioner Toni Moceri, is focused on finding pragmatic answers on how we can move from crisis to project. More concretely, by making an inventory of the effects of the crisis we will develop a series of intervention proposals, based on the reality of Macomb County. Jimini here, reporting from the depths of the DAI where a group of Unreal Estate Agents were party to a Tuesday afternoon lecture by Mireille Roddelier, Assistant Professor of Architecture at the University of Michigan's Taubman College of Architecture. The lecture was entitled ‘Urban Resistance’ - Three forms of contemporary practices: Puppets, Vanguardistas & Guerillas - on various modes of creative operations in the city, and the various forms of occupation they attempt to resist. Mirellle kicked off by asking for our definitions of the city – a lumpy silence ensued. We were clearly in need of enlightenment and this was forthcoming. She began by discussing the city as a construct, a collection of ideas and images. Ways of describing the city within a modernist view – 1. City as economic construct, as in Marx, Engels. 2. City as social dynamic. 3. Chicago School, city as psychologically disruptive element in the ‘nature’ of things. 4. City as spatial perspective. Then on to the Post-Modernist perspective. About how the art of representing or the art of oversimplification causes the thing to actually become that (which is represented). I.e. What we say is what it is. The art of representing becomes the art of creation. This is the basic and essential paradigm shift from Modernism to Post Modernism. The notion ‘The Edge of the Construct’, I recall had something to do with a paranoia about reality. Plato’s cave syndrome. About being inside an ideology from which it is impossible to step back. One has to deconstruct it from the inside. In this context Guy Debord and the situationists are mentioned – there are a lot of books being referred to which we should have read or at least been aware of, in particular Debord’s ‘Society of the Spectacle’. Then my notes say - Resistance versus occupation, … which obviously sounded worth writing down at the time but I can’t for the life of me remember the context now, sorry! Maybe something to do with the difference between (the subject of) two images, one of mass military extravaganzas, goose-stepping hordes, the other of an advertisement for shoes saying ‘buy me!’ (a persiflage). About the difference between the two methods and how the less overt one is more difficult to discern and therefore ultimately more dangerous. Haussman is mentioned in passing, the destruction of the inner city of Paris, consequential destruction of any forces of resistance. Architecture as weapon. Being … Having… Appearing…, say my notes… now this I do recognise! About how a change in attitude has come about, more or less since the end of the ‘39-‘45 war, in which rather than gleaning ones self-esteem (and esteem from others) from how one IS, ie Being, things change and it becomes about Having. Having stuff, the more you have the more you’re worth (is co-incident with, suburb building, nuclear possession). This in turn has gone a step further and it’s now no longer about actually having but about appearing to have, it about appearance, ie about Image. Books named in this context: ‘The Revolution of Everyday Life’, by Raoul Vaneigem, 1967; ‘Lipstick Traces’, by Marcus Greil; ‘Critique of Everyday Life’, Henri LeFebvre. 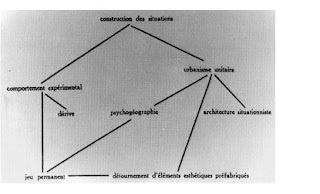 Derive - meaning drift – examples are Guy Debord and Asger Jorn’s Guide Psychogeographique de Paris: Discours sur les passions de l’amour, 1956, and other works such as ‘The Naked City’, 1957. Next the Detournement – the turn around – Naomi Klein is cited as queen of culture-jamming and we’re shown a prime example - the black-silhouette-on-fluorescent-background iPod posters juxtaposed with subversive Abu-Grahib-Man silhouette on fluorescent background, his electrical torture wires standing in for the iPod earphones- iRaq. Prime example of the Detournement – when the message (of the ‘oppressor’) is subverted using their own (image-)language. Ideally in such a way that the resultant message signifies the exact opposite of what was originally intended, or throwing light to reveal an opposite, covert side. A flipping of the image. The subversion of classic ‘Post No Bills’ stencils becoming ‘Pray For Pills’, Pay No Bills’ etc is another classic. And Much of Banksy’s graffiti can also fall into this category. The third category is ‘Urbanism Unitaire’ this deals with the idea of the utopic No-Place. Again the CoBrA group is cited and in particular Constant Nieuwenhuis’ mammoth project New Babylon, 1956-74 as the classic example. Series of ever shifting architectural units that seem to float in place and time, constantly moving form one utopian spot to the other. 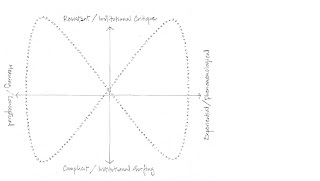 The euphemism of the term consumers is duly noted and we move on to a diagram showing crossed axis’s – one axis runs between the poles ‘Resistance/Institutional critique’ and ‘Complicity/Institutional surfing, the other axis between Meaning/Conceptual’ and ‘Experiential/Phenomenological. Where do artists (etc) fit on these axis’s? Mireille superimposes a figure eight on its side helix that she says is the course that art runs at any given time. Then.… (you’re just going to have to envisage this as I can’t seem to type on top of the diagram), various movements/strategies in art are added to this diagram – in the top left hand space, between Resistance at the top and Conceptual on the left, CONSTRUCTIVISM, DADA, SITUATIONISTS. Top Right between Institutional Critique and Phenomenological on the right is SURREALISM, ABSTRACT EXPRESSIONISM, MINIMALISM. On the bottom right between Experiential and Institutional surfing EXPERIENCE ECONOMY, ATMOSPHERING. And lastly on the bottom left between Complicit below and Conceptual on the left, POST-CRITICAL, OPERATIONAL STRATEGIES. Another book to look out for; Thomas Frank’s, ‘Why Johnny Can’t Steal – Commdify You’re Dissent’ (NY Norton 1997) a quote; “Culture is, quite simply, a binary battle between the repressive Apollonian order of capitalism and the Dionysian impulses of the counterculture. Rebellion makes no sense without repression; we must remain forever convinced of capitalism’s fundamental hostility to pleasure in order to consume capitalism’s rebel products as avidly as we do. Adding categories again… VANGUARDISTAS to Institutionalised Resistance – GUERILLAS to Institutional Critique – PUPPETS to Institutional Control – we’re getting to the core of the lecture now. Then some filling in of the categories - adding – to the Guerillas segment: The Social Conscience - Cultural Resistance, DIY movements, Alternative Movements, Counterculture, Underground Collaboratives, Partizan Publik, Interventionists - (Dionysians). In the next diagram these are condensed again, into the headings Economic Power (Puppets), Cultural Power (Vanguardistas) and Utopian Idealism (Guerillas). Then we are treated to a whole bunch of examples of these various approaches - Along the lines of Bertold Brecht > Situationists > Structuralism > Pop > F.A.T. Then, under the influence of Walter Benjamin > Henri Lefèbvre > Guy Debord > Jean Baudrillard > Hal Foster > Slavoj Žižek… The Aura > Everyday Life > Spectacle > Simulation > Total Design > The Real. Examples of the Anti-Aesthetic: books - Slavoj Zizek Interrogating the real 2005, and Welcome to the Desert of the Real, 2002; already mentioned Jean Baudrillard, Simulacra and Simulation, 1981. Search for the real in The Banal. But how to avoid aesthetics of banality, the aestheticization of the everyday? The aestheticization of the neglected & the left over (terrain vague). How to avoid aesthetics of destruction? As in Anne Lacatopn & Jean-Philippe Vassal’s, Palais de Tokyo Paris, 2001. And thirdly – following Bertold Brecht > Henri Lefèbvre > Guy Debord > Michel de Certeau > Hakim Bey - Making Strange > Everyday Life > Spectacle > Everyday Practice > TAZ. Parcours/Free Running. 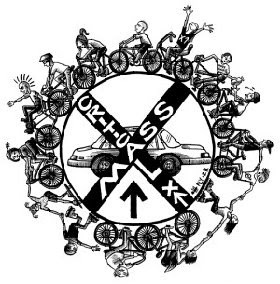 Crtitical Mass bicycle actions. Reclaim the Streets – a slogan recently stolen by the US administration for a repressive street ‘safety’ campaign. The Surveillance Camera Players (above); Reclaim The Streets (above); The Yes Men; Center for Tactical Magic; Michael Rakowitz;Krzysztof Wodiczko; Paris-Plage street festival; Pierrick Sorin, Artiste en Bâtiment, Festival Nuit Blanche 2008 ; Leandro Erlich, Bâtiment, Festival Nuit Blanche 2004. Read- The Interventionists - Users Manual for the Creative Disruption of Everyday Life, MASS MoCA Exhibit, 2004. You’ll just have to Google the rest of the images and read the books! Anyway, then, although it seemed that Mireille had material to entertain us for a few hours more, we had unfortunately run out of time. A lot to digest over the Christmas break – thank you Mireille Roddier. This documentary draws the history of techno music, from its origins in Detroit to worldwide diffusion. 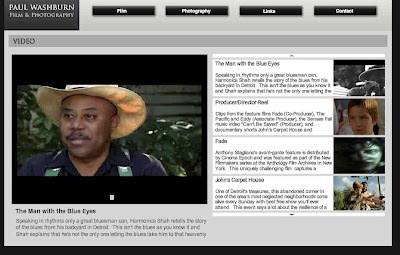 Contains interviews to the main artists of the Detroit scene. Universal Techno, directed by Dominique Deluze, France 1996. 2nd Dutch Art Institute workshop of the Detroit UnReal Estate Agency taught by Partizan Publik. The narratives, images, projects and propositions of the unreal estate market will have to be researched and laid out; a brief overview of location specifics and qualities. Central questions will be: Where and why is the market tight and is unreal estate valued highly and where are possibilities for interventions by our agents? Where is the market corrupted and who is responsible? Are open urban spaces examples of a corrupted market? As such, a first intervention will be creating an alternative lens for viewing and valuing the city, not ignoring its socio-economic problems nor the accompanying violence. In addition we draft the Unreal Estate mission statement. Also, our participants would have to work on a quick-scan of possible clients, from the fields of municipal politics, academics, real estate and property, arts and culture. These people are as much an audience to our work and ideas, as the people who can carry them further, intellectually and practically. Besides discussing work from Herscher, Harvey, Roddier, De Certeau and De Solà -Morales, we'll be screening Paul Verhoeven's RoboCop (1987). Paul Washburn is a filmmaker who grew up in the suburbs of Detroit and now lives in California most of the year. But every once in awhile he spends a few months in Detroit filming and editing his projects. Last summer he lived in Hamtramck and came into the Design 99 storefront pretty regularly. Be sure to check out John's Carpet House and on You Tube there are several recordings as well. Also, Washburn's Director's reel has a bunch of Hamtramck footage. 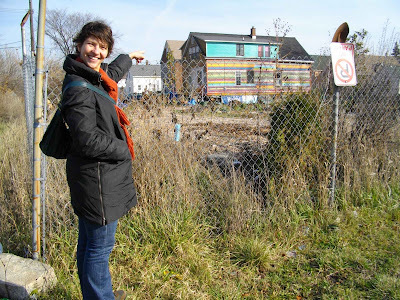 The Yes Farm - group lives over on Farnsworth on the 'Paul Weertz block' in East Detroit. They moved here from San Francisco a year or 2 ago. To learn more about this group read here about one of the initiator Andrew Kemp. Another farming project is called the Hubbard Farms in South West Detroit. They were recently involved in a street music project, entitled the Unsilent Night, which also orginated in San Francisco. Check out this You Tube movie about one of these nights in San Francisco! 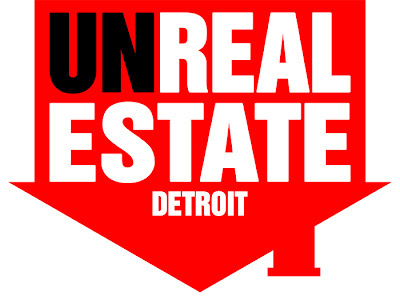 We, the agents of Partizan Publik’s Detroit Unreal Estate Agency are actively engaged in deepening and enlightening our fluency on the richly disturbing and inspiring idiosyncratic nature of Detroit, USA. As a collective Agency, we strive to explore and provoke progressive and revisionist avenues for perceiving our subject matter. We recently absorbed a wealth of primary source material and original discourse from noteworthy American architect and scholar, Michael Stanton. In an effort to broaden our understanding of Detroit, Stanton took a formulaic approach, unveiling a panorama on greater America’s urban growth and decline, illustrated vis-à-vis macro to micro impressions. Stanton’s delivery on the ‘Rise and Fall of American Cities’ was charged by a vibrant and comprehensive overview of definitive urban contrasts, traits, and most importantly, contradictions. Maximizing a range of tools from the disciplines of history, sociology, geography, economics, and architecture, glazed by an inherent and poetic passion for the subject matter, Stanton illuminated his thoughts on the turbulent nature of American urban centers ex professo. Stanton’s prefaced his lecture by referring to American cities as the greatest contradiction in the United States, where unresolved contrasts and contradictions have continued to breathe since their forced inception. As carriers of both utopian and socialist Darwinist impulses, puritanical and libertine values, bellicosity and secularism, it is the cities themselves that are emblematic of the greatest culture wars on earth. Stanton argued that it is in these very cities that the greatest collection of human art evokes the triumph and evolution of the human condition, albeit the simultaneous fostering of suffering, anxiety, and turmoil. Applying fiery historical rhetoric, anecdotes, and photographic resource materials, Stanton presented a cross-section on the evolutionary heritage of the crescendo and decrescendo of the great American urban center. Stanton’s contextualized his findings and conclusions through the humanist lens, emphasizing the growth of social extremities alongside aggressive economic and political agendas. Through careful evaluation of the city’s grid, both past and present, he argued that the American nation’s great contrivance, the concept of nature, is clearly rendered. 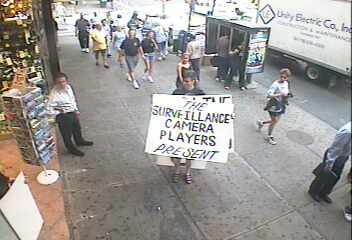 Some thoughts on surveillance, density, and the value of vandalism. "when you get some creative network or community of young people trying to live in the city in a different manner they can unwillingly become foot soldiers. Reformist politics has zero to say about this. 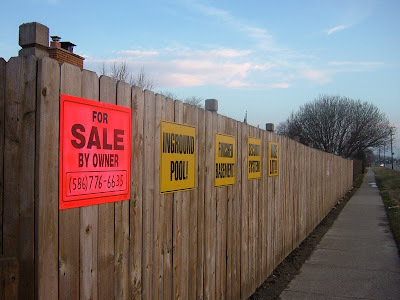 There is absolutely no reformist government anywhere in the world that can deal with the serious and major issues of urban inequality, because it will not take on property values, land inflation etc. Until you start talking about confiscating the incriminating land value or socialising land or systems of limited equity in land, you cannot control the city, you cannot achieve any real equality in it." ps. If you think the surveillance part is all good fun, you'll get a kick out of this one!